Chen Shui-bian (Chinese: 陳水扁; pinyin: Chén Shuǐbiǎn; born October 12, 1950) is a retired Taiwanese politician and lawyer who served as President of the Republic of China (Taiwan) from 2000 to 2008. Chen is the first president from the Democratic Progressive Party (DPP) which ended the Kuomintang's (KMT) 55 years of continuous rule in Taiwan. He is colloquially referred to as A-Bian (阿扁; Ābiǎn). A lawyer, Chen entered politics in 1980 during the Kaohsiung Incident as a member of the Tangwai movement and was elected to the Taipei City Council in 1981. He was jailed in 1985 for libel as the editor of the weekly pro-democracy magazine Neo-Formosa, following publication of an article critical of Elmer Fung, a college philosophy professor who was later elected a Kuomintang legislator. After being released, Chen helped found the Democratic Progressive Party (DPP) in 1986 and was elected a member of the Legislative Yuan in 1989, and Mayor of Taipei in 1994. Chen won the 2000 presidential election on March 18 with 39% of the vote as a result of a split of factions within the Kuomintang, when James Soong ran for the presidency as an independent against the party nominee Lien Chan, becoming the first non-member of the Kuomintang to hold the office of president. Although Chen received high approval ratings during the first few weeks of his term, his popularity sharply dropped due to alleged corruption within his administration and the inability to pass legislation against the opposition KMT, who controlled the Legislative Yuan. In 2004, he won reelection by a narrow margin after surviving a shooting while campaigning the day before the election. Opponents suspected him of staging the incident for political purposes. However, the case was officially closed in 2005 with all evidence pointing to a single deceased suspect, Chen Yi-hsiung. In 2009, Chen and his wife Wu Shu-chen were convicted on two bribery charges. Chen was sentenced to 19 years in Taipei Prison, reduced from a life sentence on appeal, but was granted medical parole on January 5, 2015. Since then Chen is de facto released but he is not allowed to give any public speaking because of having "medical treatments". Chen's supporters have insisted that his trial was an unfair and politically motivated retribution by the Kuomintang for his years in power. Chen was born to an impoverished tenant farming family of Zhao'an Minnanese ethnicity in Guantian Township of Tainan County (now part of Tainan City) on the second day of the ninth lunar month in 1950 but was not formally issued a birth certificate until February 18, 1951 because of doubts that he would survive. Chen was educated in Mandarin Chinese, which had replaced Japanese as the national language following the end of the Japanese administration of Taiwan. Academically bright from a young age he graduated from the prestigious National Tainan First Senior High School with honors. In June 1969, he was admitted to National Taiwan University. Initially a Business Administration major, he switched to Law in his first year and became editor of the school's law review. He passed the bar exams before the completion of his junior year with the highest score becoming Taiwan's youngest lawyer. He graduated in 1974 with an LL.B. in Commercial Law. In 1975, he married Wu Shu-chen, the daughter of a physician. The couple have a daughter, Chen Hsing-yu, who is a dentist; and a son, Chen Chih-chung, who, having received a law degree in Taiwan, gained a Master of Laws from the University of California, Berkeley in 2005. From 1976 to 1989, Chen was a partner in Formosa International Marine and Commercial Law, specializing in maritime insurance. He held the firm's portfolio for Evergreen Marine Corporation. Chen became involved in politics in 1980 when he defended the participants of the Kaohsiung Incident in a military court. While his client Huang Hsin-chieh, the leading opposition dissident, and seven co-defendants, including his future Vice President Annette Lu, were found guilty, Chen came to be known for his forceful and colorful arguments. He has stated that it was during this period that he realized the unfairness of the political system in Taiwan and became politically active as a member of the Tangwai movement. Chen won a seat in the Taipei City Council as a Tangwai candidate in 1981 and served until 1985. In 1984, he founded the pro-opposition Civil Servant Public Policy Research Association, which published a magazine called Neo-Formosa. On January 12, 1985, Chen was sentenced to a year in prison for libel as a result of his editorship of Neo-Formosa, following the publication of an article critical of Elmer Fung, a college philosophy professor. While appealing the sentence, he returned to Tainan to run for county magistrate in November 1985. Three days after losing the election, his wife, Wu Shu-chen was hit twice by a hand tractor driven by Chang Jong-tsai as Chen and Wu were thanking their supporters. She was left paralyzed from the waist down. His supporters believed this was part of a government campaign to intimidate him, although another theory says it was a simple traffic accident. Chen lost his appeal in May 1986 and began serving eight months in the Tucheng Penitentiary (土城看守所) along with Huang Tien-fu and Lee I-yang, two other defendants in the case. While he was in prison, his wife campaigned and was elected to the Legislative Yuan. Upon his release, Chen served as her legislative assistant and practiced law. In 1989, Chen was elected to the Legislative Yuan and served as the executive director of the Democratic Progressive Party caucus. With the support of some KMT colleagues, Chen was also elected convener of the National Defense Committee. He was instrumental in laying out and moderating many of the DPP's positions on Taiwan independence, including the four ifs. He was reelected to another three-year term in 1992, but resigned in two years to become mayor. Chen was elected as the mayor of Taipei in 1994, largely as the result of a vote split between the KMT incumbent Huang Ta-chou and the KMT-spin-off New Party (NP) candidate Jaw Shaw-kong. Unable to find experienced bureaucrats from his own party, Chen and his inner circle of young law school graduates retained many of the KMT administrators and delegated considerable authority. During his term, Chen received accolades for his campaigns to drive illegal gambling and prostitution rackets out of Taipei. He levied large fines on polluters and reformed public works contracts. Chen renamed many of the roads in Taipei, most notably the road which runs between KMT Headquarters to the Presidential Palace from "Chieh-shou Road" (介壽路 jiè shòu lù; "Longevity for Chiang Kai-shek Road") to "Ketagalan Boulevard" (凱達格蘭大道) in an effort to acknowledge the aboriginal people of the Taipei basin. Chen also made highly publicized evictions of longtime KMT squatters on municipal land, and ordered Chiang Wei-kuo's estate demolished. Chen was also named one of Asia's rising stars, and Taipei became one of the top 50 cities in Asia according to Time Magazine's Asia version. Despite receiving more votes both in absolute and in percentage terms than his 1994 campaign, Chen lost this position in 1998 to the KMT's Ma Ying-jeou in large part because the KMT was able to gain the support of New Party supporters. In his first autobiography, "The Son of Taiwan", Chen wrote that he was not entirely upset about losing the reelection as it gave him opportunity to find out what areas in his political career he could improve. For example, he wrote that Mainlanders generally approved of his social and economic improvements in Taipei, but they ultimately voted for Ma because of ethnic tensions. He also traveled extensively nationwide and abroad. In South Korea, he met with President Kim Dae Jung, who presented him with an award. He also met with Japanese Prime Minister Yoshiro Mori, who promised that he would celebrate if he won the 2000 presidential elections. Due to political complications, this promise was not fulfilled until late 2003. In an election similar to Taipei's in 1994, Chen won the 2000 presidential election on March 18, 2000 with 39% of the vote as a result of a split of factions within the Kuomintang, when James Soong ran for the presidency as an independent against the party nominee Lien Chan. Lacking a clear mandate and inheriting a bureaucracy largely loyal to the KMT, Chen tried to reach out to his opposition. He appointed the KMT conservative mainlander Tang Fei, a former general and the incumbent defense minister, as his first Premier. Only about half of Chen's original cabinet were DPP members, as few DPP politicians had risen above the local level. Although a supporter of Taiwan independence, Chen moderated his stance during his campaign and pledged the Four Noes and One Without in his inaugural address—that as long as the People's Republic of China has no intention to use military force against Taiwan, he would not declare independence nor change the national symbols of the Republic of China. He also promised to be, "President of all the people" and resigned his chairmanship from the DPP. His approval rating reached around 70%. Chen's administration ran into many problems, and its policies were constantly blocked by the Pan-Blue Coalition-controlled legislature. The stock market lost over half its value within a year and unemployment reached 4.5% in part because of the Asian stock market crash. While Chen's detractors blamed Chen's poor leadership for the economic crisis, the administration blamed the legislature for blocking its relief efforts. More troublesome for Chen was the political showdown over the construction of the Number Four Nuclear Power Facility. This multibillion-dollar project in Gongliao District was already one-third completed and favored by the pro-business KMT as a means of avoiding an energy shortage. However, the environmentalist DPP strongly objected to the expansion of nuclear power. Premier Tang had threatened to resign if the project were canceled, and Chen accepted his resignation on October 3, 2000, only four and a half months after both had taken office. Chen appointed his political ally Chang Chun-hsiung as Tang's replacement. On October 27, Chang announced that the government would halt construction. But less than an hour before, President Chen had met with Lien Chan to reconcile differences. Lien had asked Chen to leave the matter for the Legislative Yuan to decide and Chen seemed receptive to the suggestion. When Chang's announcement came out, Lien was furious and the KMT began an effort to recall the President. The Council of Grand Justices intervened and declared that it was the legislature and not the cabinet that had the power to decide on the issue. This was widely seen as the end of Chen's attempts to face the pan-blue groups head on. By the end of his first year in office, Chen's approval ratings had dropped to 25%. During summer of 2001, Chen flew to Los Angeles, Houston, and New York City, where he met with members of the U.S. Congress. The mayor of Houston presented Chen with a key to the city and gave him cowboy clothing. His trip to New York was a first for a head of state from Taiwan as there was unwritten agreement between the US and China that no head of state from Taiwan would be permitted to visit either New York or Washington, D.C.
After his first year in office, Chen moved away from sending conciliatory gestures. In the summer of 2002, Chen again became the chairman of the DPP. During his tenure, images of Chiang Kai-shek and Chiang Ching-kuo disappeared from public buildings. The word "TAIWAN" is now printed on new ROC passports. Also continuing a trend from the previous administration, the Education Ministry revised the school curriculum to be more Taiwan-centered. Government websites have also tended to promote the notion that China is synonymous with the PRC instead of the ROC as was mandated by the KMT. The "Free China Review" was renamed the Taiwan Review and Who's Who in the ROC was renamed Who's Who in Taiwan. In January 2003, a new Taiwan-Tibet Exchange Foundation was formed but the Cabinet-level Mongolian and Tibetan Affairs Commission was not abolished. Though Chen has proposed talks with the PRC, relations remain deadlocked as Chen refused to pledge to the One-China policy, as required by the PRC for talks to begin. Such a pledge seemed unlikely for Chen since there remained strong opposition within his own party. Despite these symbolic gestures, Chen moved away from "no haste, be patient" policy and opened the three mini links. In late 2003, he signed a controversial referendum bill, which he had supported but was heavily watered down by the Pan-Blue majority legislature. One concession that the legislature made was to include a provision for an emergency defensive referendum and during the legislative debates it was widely believed that this clause would only be invoked if Taiwan was under imminent threat of attack from China as has been so often threatened. Within a day of the passage of the referendum bill, Chen stated his intention to invoke this provision, citing PRC's over 450 missiles aimed directly at the Taiwanese. Pan-Blue believed that his bill was only intended to benefit Chen in the coming election, as whether PRC removes the missiles would not be pressured or decided by referendum result. Images of Chiang Kai-shek were removed from public buildings. Chen's portrait was hung at a location in the Presidential Office that previously displayed a portrait of Chiang. In October 2003, Chen flew to New York City for a second time. At the Waldorf-Astoria Hotel, he was presented with the Human Rights Award by the International League of Human Rights. In the subsequent leg of the trip to Panama, he met with US Secretary of State Colin Powell and shook hands with him. This high-profile trip raised Chen's opinion polls ahead of his opponent Lien Chan for the first time at 35%, according to Agence France-Presse. His use of the referendum in combination with his talk of a new constitution lead many among his reunification critics to believe that he would attempt to achieve Taiwan independence in his second term by invoking a referendum to create a new constitution that would formally separate Taiwan from any interpretation of China. This caused the government of the United States to follow the lead of Chen's political critics and issue a rare rebuke of Chen's actions. Chen was reportedly shot in the stomach while campaigning in the city of Tainan on Friday, March 19, 2004, the day before polls opened on Saturday. According to Chen, the bullet left a flesh wound that was 11 cm long and 2 cm deep and was found in his clothes. He left the hospital on the same day with 14 stitches. His Vice President Annette Lu was also reportedly shot in the leg in the same incident. After the election, video from the hospital Chen and Lu were taken to showed Chen walking into the hospital after the Presidential Office Secretary General said that he had been taken in. The opposition made many allegations into the conduct of the security and hospital procedures requiring Chen and Lu to change parts of their stories in order for it to make sense. While many theories were put forth, the opposition had no access to the physical evidence so the Criminal Investigation Bureau (CIB) refuted them. The following day, Chen narrowly won the election with a margin of less than 30,000 votes out of 12.9 million votes counted. Both of his referendum proposals were rejected due to insufficient turnout, in part by the Pan-Blue boycott. Those that did vote for the referendum overwhelmingly favored it. Due to the activation of the so-called National Security Mechanism which prevented military officers from voting, and island-wide reports of election fraud, Pan-Blue candidate Lien Chan refused to concede and sued both for a recount and for a nullification of the outcome while supporters held a week-long protest led by the Pan-Blues front of the presidential office in Taipei. He also claimed that the shooting was staged by Chen to win sympathy votes. Chen claimed that the shooting could not have been staged, because it would be too dangerous to have himself shot in a moving jeep and also challenged Lien and vice-presidential candidate James Soong to try their luck with a shooter in a stationary jeep. This challenge was based on the assumption that his belly wound was inflicted while he was in the moving jeep and not before or afterwards. The opposition also raised the fact that Chen had faked a food poisoning incident while running for Tainan County Commissioner in 1985. Chen arrived at a debate on a stretcher accusing the KMT of poisoning his tea earlier. Later that night after the debate, Chen was seen as having no ill-effects from the apparent incident which prompted the opposing candidate to accuse him of staging the incident to garner sympathy. The CIB hired renowned forensic scientist Henry Lee (forensic scientist) to examine the physical evidence. Dr. Henry Lee was famous for defending O.J. Simpson in the murder of his wife and lover, and helped acquit Simpson based on the LAPD's lack of professionalism and possibility of planted evidence at the murder site. Dr. Henry Lee and his team of Americans had previously established the belly wound was in fact a gunshot wound, and then claimed the windshield hole had been struck from the outside based on the lack of windshield powder outside the jeep. Despite widespread speculation that the casings were planted on the street, Lee expressed no concern regarding the origin of the evidence even though the casings had been found some 3½ hours after the incident occurred and street cleaning had cleaned up the firecracker debris. Dr. Lee was also not critical of the local police and National Security Bureau's inability to secure the scene of the incident afterwards until the casings were found. Several months later, Lee released a report on the evidence and suggested to the CIB to trace the suspect according to the casings and bullets. In March 2005, Chen Yi-hsiung, a local Tainan resident, was the main suspect for the shooting but allegedly committed suicide 8 days after the election. The CIB closed the case in August 2005 implicating him as the shooter. But in 2006, James Chun-i Lee, a professor at National Taiwan University's Graduate Institute of Forensic Medicine, led an investigation and concluded that Chen Yi-hsiung was most likely murdered, because his body, wrapped in a fishing net, was dumped into the water only after he died. Another report reached by the CIB task force concludes that the two bullets could not have come from the same pistol because a 9.1 mm bullet would not fit into a 9 mm pistol that the police said was used by the suspect. The KMT continues to claim that it was all engineered by Chen to this day. Throughout the election, Chen planned to hold a referendum in 2006 on a new constitution to be enacted upon the accession of the 12th-term president in May 2008. After the election, he sought to reassure critics and moderate supporters that the new constitution would not address the issue of sovereignty, and that the current constitution was in need of comprehensive reform after more than a decade of patchwork revision. There have been two interpretations of Chen's actions during the election in terms of independence politics. The first is that he is ideologically committed to advancing Taiwan independence and that his actions are intended to systematically remove the constraints which prevent this from occurring. Seen in this light, his actions are intended to provoke a crisis in which the PRC must either start a war or accept independence, with the expectation that the PRC would back down. Ironically, this interpretation of his actions is shared both among his most fervent supporters (who think it is a good thing) and his most bitter opponents (who think that it is a bad thing). It is largely to counter this possibility that the PRC has issued statements that it will definitely go to war if certain red lines are crossed. However, they in reality carry little meaning, as Beijing has made such statements warning against electing former President Lee and Chen in the 1996 and 2000 elections, which both failed to materialize. Some people regard these statements now as reverse psychology, as Lee and Chen may help to weaken ROC and advance the unification process. The second interpretation is that Chen's actions were primarily intended to placate his core supporters rather than provoke a crisis. People who subscribe to this interpretation point out that Chen's early efforts to moderate his pro-independence position did not create a positive reaction either from the PRC or from his anti-independence opponents on Taiwan. He also alienated some pro-independence supporters. Therefore, Chen was forced to take a more assertive approach both as a negotiation tactic with the PRC and to keep support from his core supporters. This strategy is consistent with the oft-stated position that Taiwan would only seek independence as a preemptive measure in the face of evidence of PRC military aggression. However, even this interpretation provokes unease among many people, especially among policy makers in the PRC and the United States. The first problem is that this interpretation makes Chen seem like an old-style Taiwan politician that seems to say whatever pleases people. The second, more serious problem is the fear that through misunderstanding and misinterpretation, Chen may have provoked a war without intending to do so, as the PRC has repeatedly claimed that any progress towards independence would provoke war. On May 20, 2004, Chen was sworn in for his second term as President amid continued mass protests by the pan-blue alliance over the validity of his re-election. Having heard protests from pro-independence figures in Taiwan, he did not explicitly re-state the Four Noes and One Without but did state that he reaffirmed the commitments made in his first inaugural. He defended his proposals to change the constitution, but asked for constitutional reform to be undertaken through existing procedures instead of calling for a referendum for an entirely new constitution which was proposed by former president Lee Teng-hui. This would require approval by a three-fourths majority of the National Assembly which could authorize a referendum. This has two major implications. First, by going through existing constitutional amendment procedures, this has the symbolic effect of maintaining continuity with the existing constitution which was originally written in China. Second, this has the practical effect of requiring the Chen administration to get the consent of the opposition Pan-Blue coalition to pass any amendments, and while the opposition is willing to consider constitutional reforms that would increase governmental efficiency, they are unlikely to support anything that would imply a de jure declaration of independence. However, even these seemingly conciliatory gestures did not quell unease by his critics at his election. Some have pointed out that he qualified his statements on the constitution with the statement that this is a personal suggestion. Furthermore, it is widely believed in Taiwan that some of these gestures were essentially forced on him again by pressure from the United States and the PRC. The PRC has stated many times that it cares little about what Chen says, but will watch closely in the next few months to see what he does, a standard sentence that Communist China continues to quote. Chen Shui-bian addressed his opening speech at "2006 Taiwan Sports Elite Awards"
Three days before Chen's inauguration, the Taiwan Affairs Office of the PRC issued what has become known as the May 17 Declaration. In that declaration, China accused Chen of continuing with a creep toward independence, having merely paid lip service to his commitments in his first term of office, and reiterated that there would be consequences if Chen did not halt policies toward Taiwan independence, but at the same time offered major concessions if Chen would accept the One China Principle. In late 2004, in effort to maintain the balance of power in the region, Chen began eagerly pushing for an US$18 billion arms purchase from the United States, but the Pan-Blue Coalition repeatedly blocked the deal in the legislature. Criticism has been made of this, citing contradictory arguments used, such as that the weapons were not what Taiwan needed, or that the weapons were a good idea but too expensive. By late 2006, the KMT had signalled it would support some of the arms sale being approved, but failed to pass a revised arms bill by the end of the legislative session in early 2007, despite promises by then KMT chairman, Ma Ying-jeou, to do that. Chen announced on December 5 that state-owned or private enterprises and foreign offices bearing the name "China", such as China Airlines, the China Steel Corporation, and Chinese Petroleum Corporation, would be renamed to bear the name "Taiwan." On December 14, 2004, following the failure of the Pan-Green coalition to gain a majority of seats in the ROC legislative election, 2004 (as many had expected to occur), Chen resigned as chairman of the DPP. This dashed hopes that the stalemate that plagued Chen's first term would end. At the funeral of Pope John Paul II, Chen (far left), whom the Holy See recognized as the head of state of China, was seated in the front row (in French alphabetical order) beside the first lady and president of Brazil. In 2005 Chen became the first ROC president to visit Europe, when he attended the funeral of Pope John Paul II in the Vatican City (the Holy See continues to maintain diplomatic relations with the ROC). In order to shore up diplomatic support, it is common for the ROC president to visit the ROC's remaining diplomatic allies; however past presidents had been prevented from visiting the Vatican because such a visit would require passage through Italy, which maintains relations with the PRC. Under agreement with the Vatican, Italy permitted all guests to the funeral passage without hindrance and Chen was received at Rome's airport in his capacity as a foreign head of state. In this religious ceremony where U.S. President George W. Bush greeted Iranian President Khatami, Chen did not seem to attempt making a high profile of himself by reaching out to other heads of states such as Bush or British Prime Minister Tony Blair. Chen was named one of the Time 100 for 2005. Later in the year, Chen traveled to Miami in stopover for a forum in the Caribbean. He met with members of the U.S. Congress through video conference and was invited to visit Washington, D.C. On his way back, he was originally scheduled to fly through San Francisco. However, he changed course and stopped-over at the United Arab Emirates. The head of state greeted him and hosted a formal state dinner, infuriating the Chinese officials. Chen made his way back after making a stopover at Jakarta. His request for a pitstop at Singapore was denied; authorities cited weather problems. On May 3, 2006, Chen canceled plans to pass through the United States on his way to Latin America. He was hoping to stop by either San Francisco or New York City to refuel and stay overnight, but the US refused his request instead limiting him to a brief refuelling stopover in Anchorage, Alaska where Chen would not be allowed to step off the plane. Chen and Taiwan saw this as a snub and led to Chen's cancellation. The trip to Latin America will continue, however, without a US stopover. The US State Department claimed that the Alaska stopover offer was consistent with its previous accommodations. However, former Taiwan president Lee Teng-hui was granted a visit to Cornell University eleven years ago. More recently, in addition, Taiwan's leaders have in general been granted permission to stopover in the United States for brief periods before continuing on to other countries. This recent American stance is interpreted by Taiwan to be an expression of the increasing irritation the United States feels towards Taiwan and Chen's seemingly pro-independence gestures. Chen attended the inauguration of Óscar Arias, the president of Costa Rica, one of the few countries that recognized the Republic of China at that time. Laura Bush was also present to represent U.S. president George W. Bush. Chen seized the opportunity, approached her and shook her hands, while Chen's aide produced a camera immediately for an impromptu photo-op. Chen's supporters saw this act as a step forward in Taiwan's struggle for diplomatic recognition, while his detractors claimed that it was a grave breach of international etiquette and put Taiwan to shame. On May 12, 2007, Premier Su Tseng-Chang resigned his position, and Chen soon appointed Chang Chun-hsiung to fill the vacant premiership. During Chen's tenure, beginning in 2000, the country has seen six different premiers in the past seven years. During the same period of time, from 2000 onward, the Democratic Progressive Party has also seen seven different chairmen. 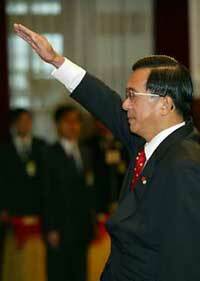 Chen's tenure as President expired on May 20, 2008, yielding to successor Ma Ying-Jeou. From his election to his first term to his last days as President, Chen's approval ratings fell from 79% to just 21%. In May 2006, his approval rating, as determined by the TSU, fell to 5.8%, after a series of scandals centered on his wife and son-in-law. Additional sources showed his approval rating at around 20%. Support from his own party has also dropped with a few members calling for his dismissal as he had a bad influence on his party and has already caused them to lose the Republic of China presidential election, 2008. On May 24, 2006, his son-in-law, Chao Chien-ming, was taken into custody by the Taipei police on charges of insider trading and embezzlement by the opposition party. This was a setback for the Chen Shui-bian administration. In related charges, there were accusations from the opposition party that Chen Shui-bian's wife was involved in trading stocks and obtaining Pacific Sogo Department Store's gift certificates illegally in exchange for settling the disputed ownership. On June 1, 2006, Chen declared that he was handing control of governmental matters to Premier Su Tseng-chang and announced he would not be involved in campaigning. He also stated that he was retaining authority on matters that the Constitution required him to retain authority over, presumably foreign affairs and defense policy, as well as relations with the PRC. On July 20, 2006, Opposition politicians accused that Chen used a total of NT$10.2 million (US$310,000) worth of "fake invoices" to claim expenses after the National Audit Office found irregularities in Presidential Office accounts. The Taiwan High Court Prosecutors' Office is currently investigating over this accusation. In a press release issued by the Presidential Office responded that the president assured the investigators that he did not pocket a single cent of the fund. During questioning at the Presidential Office on the afternoon of August 7, 2006, the president detailed to the prosecutor how he spent the fund and presented relevant receipts and bank remittance statements. President Chen also lost a libel case brought on successfully by PFP chairman James Soong. Soong sued the President after Chen repeatedly accused him of secretly meeting the director of the People's Republic of China's Taiwan Affairs Office. Soong successfully sued Chen for NT$3 million. On November 3, 2006, Chen's wife Wu Shu-chen and three other high-ranking officials of the Presidential Office were indicted of corruption of NT$14.8 million (US$450,000) of government funds using faked documents. Due to the protection from the Constitution against prosecution of the sitting president, Chen could not be prosecuted until he left office, and he was not indicted, but was alleged to be an accomplice on his wife's indictment. The prosecutor of the case indicated that once Chen left office, his office would start the procedures to press charges against Chen. The indictment filed by prosecutors states that the indicted persons obtained government funds earmarked for secret foreign affairs, yet of six supposed secret diplomatic missions, there was sufficient evidence presented for only two. Of the remaining four, it was concluded that one did not exist, and in the case of the other three, the invoices presented were not found to be related to the secret missions. The Pan-Blue coalition, after receiving the news, demanded to call for another recall motion unless Chen resigned immediately. Another small party that backed Chen previously, Taiwan Solidarity Union, said Friday they would likely to support the upcoming recall measure. If the recall passed, it would be up to the voters to decide Chen's fate in an island-wide referendum. Leaders of the Democratic Progressive Party met together to discuss the unfavorable charges. The meeting ended when party leaders demanded Chen to explain the accusation within three days. There has long been crumbling inside the DPP that Chen has become their liability and should recall him before the presidential election. If Chen resigned, he would be the first Taiwanese president to step down and the vice-president, Annette Lu, would likely take power. After the prosecutor announced the indictment news, the campaign leader Shih proclaimed that the indictment was the historical high point in Taiwan and the month-long campaign was a success. In a press conference November 5, 2006, Chen rebutted the charges against his wife and members of his Presidential office. He said that Taiwan government offices advised him to prepare the receipts in such a fashion, and that after six years of doing so, it is strange that they would never mention an irregularity if it was not the right way to do it. He promised that all of the money actually went to diplomatic missions and did not go into any private pockets. Furthermore, he mentioned that when he took office, he thought his salary was so excessive that he cut his own salary in half, and that reduction is more than the amount he is accused of embezzling, so there is no need for him to take that money. In addition, he said that if the charges against his wife were proven in a court of law just as they were charged, then he would at that time step down as President of the Republic of China. In defense of Chen, journalist Therese Shaheen of The Wall Street Journal Asia pointed out that controversy surrounding Chen can be in part attributed to the radical reforms he has tried to implement since stepping into power. In mid-June 2007, opposition pan-blue camp lawmakers initiated a recall motion that would allow the voters to remove Chen from power via a public referendum. On June 20, President Chen addressed the nation by television, denying any involvement of the first family or himself (other than his son-in-law) in any of the alleged scandals, or "directly" accepting the department's gift certificates. The motion was not passed. Of 221 lawmakers in the Legislature, all 119 pan-blue and independent legislators voted in favor of the measure, 29 votes short of the two-thirds majority needed to pass the motion. Pan-green legislators from the president's own party, the DPP, refused to receive ballots. Pan-Green legislators from the allied TSU cast abstaining ballots. No legislator voted against the recall motion. After Wu was indicted, the Pan-Blue parties renewed calls to recall Chen, and TSU at first indicated that it would support the recall this time, but then said it would only support the new recall motion if "concrete evidence concerning corruption is presented." On September 1, 2006, political activist Shih Ming-te launched an "anti-corruption campaign". The movement accused Chen of corruption and asked for his resignation. By September 7, more than one million signatures were collected, each with a donation of NT$100 (approximately US$3.00). On September 9, tens of thousands of people demonstrated in the streets of Taiwan, wearing red. According to organisers, around 200,000 to 300,000 people joined the protest outside the presidential offices, but the police used aerial photography crowd counting techniques to put the number at about 90,000. Shih Ming-teh confirmed that most of his supporters are from the Pan-Blue Coalition in a September interview in The New York Times. In the Republic of China legislative election in 2008, Chen's party suffered a clear defeat, and Chen subsequently resigned as party chairman. With Chen's resignation and Frank Hsieh's ascension as the party's new chairman, the DPP has changed chairmen seven times since Chen took office in 2000. In the presidential election on March 22, 2008, Kuomintang candidate Ma Ying-jeou defeated DPP candidate Frank Hsieh. Chen stepped down on May 20, 2008, the same day that Ma Ying-jeou took office as the new President of the Republic of China. No longer bearing the title of President, Chen left the Presidential Office Building, his presidential immunity was removed. He was placed under restrictions, such as confinement to Taiwan, by prosecutors as a result of allegations of corruption and abuse of authority, both of which he was later charged guilty of. [clarification needed] One fraud case involved the handling of a special presidential fund used to pursue Taiwan's foreign diplomacy. President Ma Ying-jeou declassified government documents which aided the investigation into Chen's usage of special government funds. Chen's lawyers responded by suing Ma, on August 6, 2008, alleging Ma's declassification of the documents that were initially classified by Chen to be "politically motivated." The documents consisted mainly of receipts and other records of special expenses, which according to Ma's chief aide assured pose no danger to the country's interests once declassified. After two years of investigation, it was found that Chen Shui-bian received millions from the owners of the TCC Company after the government bought the Longtan land, which was then integrated into the Science Park project. There were several other incidences of corruption, which became the subject of a graft trial that also included the former president's wife and 11 other co-defendants. The trial revealed that Chen and his wife amassed a total of NT$800 million and some were laundered overseas. The former president was found guilty by the Taipei District Courts of violating Punishment of Corruption Act (貪污治罪條例), Money Laundering Control Act (洗錢防制法), and Criminal Code (刑法). On September 11, 2009, Chen received a life sentence and was fined NT$200 million (US$6.13 million) for embezzlement, bribery and money laundering involving a total of US$15 million (NT$490 million) in funds while in office from 2000 to 2008. Supporters of Chen contended that the prosecution was politically motivated. Chen is the first ROC president to receive a prison sentence. On June 8, 2010, the Taipei District Court found Chen not guilty of embezzling diplomatic funds. On June 11, 2010, the High Court decided to reduce Chen's life sentence to 20 years. Through several court cases and pleads for bail, the High Court rejected his request for bail and continued to detain him in jail for another 5 months. The detention led Chen's supporters to protest that the detention of Chen for more than 600 days without proving him guilty[clarification needed] was illegal, inhumane and unjust, and a result of political revenge by the part of the Kuomintang (KMT). The Yellow Ribbon Movement took to demonstration over alleged exploitation of justice and political revenge. Meanwhile, on August 17, 2010, both the Taipei District Court and the High Court found ex-deputy military minister, Cheng-Hen Ke (柯承亨), not guilty of revealing non-military secrets to former president Chen Shui-Bian. The parliament with a KMT and pan-blue coalition majority passed an amendment to the Act Governing Preferential Treatment for Retired presidents and Vice presidents (卸任總統副總統禮遇條例) on August 19, 2010. Introduced by the KMT, the amendment stipulated that former presidents and vice presidents will be stripped of courtesy treatment, including their monthly allowance and annual expenses, if convicted by a court of grave offense(s), such as sedition and graft. The number of bodyguards assigned to former presidents and vice presidents who are convicted of corruption in a first trial will also be reduced. Former president Chen's son stated the act was created to target the now imprisoned former president (陳水扁條款). Chen had been admitted to hospital after public protest and support. He suffers serious health problems and refuses to eat. He suffers from paranoia of food poisoning, but he was diagnosed with serious sleep apnea. He has a stuttering in his speech, tremor of the hands, cerebral syndrome, loss of memory, brain atrophy, deterioration of the brain, and cannot walk properly. He attempted suicide on Sunday, June 2, 2013, but was unsuccessful. In 2015, Chen was released from prison on medical parole due to his ailing condition. Chen's illnesses are not exactly known but reports indicate that these could include nerve degeneration and sleep apnea, and could be life threatening. Chen's and the Democratic Progressive Party position on Taiwan's political status is that Taiwan is already an independent, sovereign nation named the Republic of China. This has the implication that a declaration of independence is unnecessary as Taiwan is already independent. This view point, however, is subject to change in each election campaign. At the same time, it also has the implication that the pledge by Chen to preserve the status quo or not change Taiwan's sovereign status would not preclude a declaration of independence but would preclude acceptance of the one China policy. Some said that Chen's position on this issue was intended and to some degree succeeded in placating his pro-independence supporters without crossing any red lines that could trigger war with the PRC. His supporters saw these positions as creative and indicative of a willingness to compromise. However, it was also common among his opponents in Taiwan, as well as among policy makers in China and the pro-PRC United States politicians to see his statements in their own much darker terms. Many among his critics (especially those from the Pan-Blue coalition) believed that his positions and actions showed that his seemingly conciliatory statements were merely a smokescreen to advance a hidden agenda of advancing de facto Taiwan independence. These suspicions appeared to arise from the actions of his KMT predecessor Lee Teng-hui who now readily admits to secretly trying to advance de facto Taiwan independence during his presidential terms. President Chen admitted that he leans towards independence but his main position is opposition to adopting the One China principle since it prevents Taiwanese people from being able to decide upon their own future. President Chen referred to himself and a crowd of Taiwanese Americans as "Chinese" in a speech at the Waldorf Astoria Hotel. [self-published source] Chen told the media that "If there is an opportunity to go to the mainland, I would like to go to my old village in Fujian." Chen admitted that Chinese migrants from Fujian are the ancestors of Taiwanese and that his own ancestors migrated in the 18th century from Fujian. Ancestral hometowns in Fujian in mainland China have been visited by DPP leaders and their families. In an interview in July 2005, Chen explicitly repudiated the position of Lee Teng-Hui that Taiwan / Republic of China and China / People's Republic of China are two different countries. He said, "The Republic of China on Taiwan and the People's Republic of China on the mainland are two separate countries with divided rule and do not exercise sovereignty over each other," he said. "Under the principle of popular sovereignty and self determination, we consider that the question of whether Taiwan should be united with China should be the decision of the 23 million people of Taiwan." On February 28, 2006, Chen announced the National Unification Council, set up in 1990, and its guidelines, which had committed Taiwan to unification if China adopts democracy, would "cease to function". He took care to use the phrase "ceased to exist" rather than abolish when he made the announcement because he had promised in 2000 that he would not abolish the council or its guidelines. Newspapers on both sides of the Taiwan strait criticized Chen severely for scrapping the unification council although others reported that Chen may have acted in reaction towards China's Anti Secession Law. On March 2, 2006 in a stern announcement, Adam Ereli, Deputy Spokesman of the US state department, said that the US expected the Taiwan authorities to publicly correct the record that there is no distinction between "abolish" and "ceasing activity" and unambiguously affirm that the February 27 announcement did not abolish the National Unification Council and did not change the status quo and that the assurances remain in effect. ^ "Chen Shui-bian released". Taipei Times. January 6, 2015. p. 1. ^ "Chen Shui-bian now prisoner No. 1020". Taipei Times. December 4, 2010. p. 1. ^ Sui, Cindy (March 30, 2009). "Differing views on Taiwan trial". BBC News. ^ "Terms of imprisonment". The Economist. ^ "Chen's trial unfair, FAHR mission says". Taipei Times. December 31, 2016. Retrieved January 7, 2017. ^ McCarthy, Terry (March 27, 2000). "Profile of a President". Time Asia. Retrieved April 14, 2016. ^ Magnier, Mark; Tsai, Ting-I (June 23, 2006). "Taiwan's Chief Under a Cloud". Los Angeles Times. Retrieved April 14, 2016. ^ Lam Peng-Er (January 1, 2004). "Japan-Taiwan Relations: Between Affinity and Reality". Asian Affairs. 30 (4): 251. JSTOR 30172589. However, Chen Shui-bian, like most Taiwanese of his generation, does not speak Japanese. Chen's generation was educated in Chinese, a policy spearheaded by the KMT regime to resynthesize Taiwan after more than half a century of Nipponization. ^ Eyton, Laurence (March 16, 2000). "Made in Taiwan". Taipei Times. p. 9. ^ "Taiwan Quick Take: Chen's son graduates, again". Taipei Times. May 15, 2006. p. 3. ^ Moore, Jonathan; Roberts, Dexter (November 16, 1998). "Taipei's mayor: The man China fears". Bloomberg Businessweek. Archived from the original on January 21, 2011. Retrieved September 30, 2014. ^ Wang, T. Y. (2002). "Lifting the 'No Haste, Be Patient' Policy: Implications for Cross-Strait Relations". Cambridge Review of International Affairs. 15 (1): 131–139. doi:10.1080/09557570220126342. ^ Smith, Noah J, (December 29, 2000). "China opens door to direct trade links with Taiwan". The Independent. Retrieved September 1, 2018. ^ Pan, Philip P.; Culpan, Tim (January 16, 2005). "China, Taiwan Agree to Direct Flights". Washington Post. Retrieved September 1, 2018. ^ "Taiwan stands up". The Economist. March 23, 2000. Retrieved September 1, 2018. ^ John Pike (February 21, 2008). "KMT will not rule out reinvestigating `319' shooting". Globalsecurity.org. Retrieved January 7, 2017. ^ "The 2005 TIME 100". TIME. Retrieved January 7, 2017. ^ @ http://udn.com/ (May 20, 2008). "聯合新聞網 | 國內要聞 | 陳水扁主政功過 | 聯合報民調》扁八年 滿意度79%→21%". Udn.com. Archived from the original on April 11, 2010. Retrieved March 26, 2009. ^ "Asia-Pacific | Taiwan leader surrenders powers". BBC News. June 1, 2006. Retrieved January 7, 2017. ^ "Taiwan's Chen in corruption case". BBC News. November 3, 2006. Retrieved November 4, 2006. ^ Shaheen, Therese (November 8, 2006). "Taiwan's "Refuse-to-Lose" Crowd". The Wall Street Journal Asia. Dow Jones & Company. Archived from the original on November 16, 2006. Retrieved November 26, 2006. ^ Gluck, Caroline (September 7, 2006). "Protests against Chen gain ground". BBC News. Retrieved September 9, 2006. ^ "Taiwan leader faces mass protest". BBC News. September 9, 2006. Retrieved September 9, 2006. ^ Ralph Jennings, "Taiwan new leader takes office on China pledges", Reuters (International Herald Tribune), May 20, 2008. ^ Min, M. A. O. (December 27, 2017). The Revival of China （with Pictures）. Mao Min. ^ a b "Chen Shui-bian gets life - Taipei Times". www.taipeitimes.com. Retrieved August 20, 2018. ^ "Taiwan's Chen Won't Appeal His Detention". Washingtonpost.com. Retrieved January 7, 2017. ^ "Chen Shui-bian gets life". Taipei Times. December 31, 2016. Retrieved January 7, 2017. ^ "外交零用金案 扁一審無罪". Liberty Times. June 9, 2010. Archived from the original on June 12, 2010. ^ "Taiwan court finds ex-President Chen Shui-bian not guilty of misusing diplomacy funds – No evidence of Chen wiring state funds to son: Court". Taiwan News. June 8, 2010. ^ "國務費貪污金額二審從寬認定／扁珍改判20年--扁堅持無罪將上訴". Liberty Times. June 12, 2010. Archived from the original on June 14, 2010. ^ "High Court extends former president's period of custody". Taipei Times. June 19, 2010. ^ "海外款未全匯回 扁續押兩個月". Liberty Times. June 19, 2010. Archived from the original on June 22, 2010. ^ "扁再押三月 將提抗告". Archived from the original on October 17, 2012. ^ "High Court extends Chen detention by three more months". Taipei Times. July 20, 2010. Archived from the original on March 25, 2012. Retrieved August 17, 2010. ^ "民進黨籲停押扁 改革羈押制度". Liberty Times. April 8, 2010. Archived from the original on April 12, 2010. ^ "馬上司法辦綠不辦藍，馬英九哈佛的老師孔傑榮呼籲台灣司法界知道〈公益與私利〉，蔡英文聲明：落實司法人權，並停止羈押陳前總統". various sources. June 29, 2009. ^ "全國繫黃絲帶 援扁司法人權". Liberty Times. July 13, 2009. Archived from the original on September 21, 2009. ^ "柯承亨洩密案 無罪確定". Liberty Times. August 18, 2010. Archived from the original on August 20, 2010. ^ "立院三讀／貪污一審有罪 扁禮遇金沒了". Liberty Times. August 20, 2010. Archived from the original on August 22, 2010. ^ "Chen Shui-bian's son slams KMT over amended act". Taipei Times. August 21, 2010. Archived from the original on March 25, 2012. Retrieved August 20, 2010. ^ "窮到只剩下阿扁". Liberty Times. August 21, 2010. Archived from the original on August 23, 2010. ^ "扁禮遇被刪 本土社團批報復性條款". Liberty Times. August 24, 2010. Archived from the original on August 26, 2010. ^ "Jack Healey's Free Chen Shui-Bian video". Human Rights Action Center. July 14, 2015. ^ "Taiwan's jailed former president Chen Shui-bian attempts suicide, say officials". Ndtv.com. June 3, 2013. Retrieved January 7, 2017. ^ a b "Former Taiwan president Chen Shui-bian released on medical parole". ABC News. January 6, 2015. Retrieved August 20, 2018. ^ Thian-hok Li (2010). America's Security and Taiwan's Freedom: Speeches and Essays. Xlibris Corporation. pp. 333–. ISBN 978-1-4500-6227-5. ^ "CNN.com - Taipei opposes nuclear solution - March 31, 2002". Edition.cnn.com. Retrieved January 7, 2017. ^ "Make Taiwan your home: Chen". Taipei Times. December 31, 2016. Retrieved January 7, 2017. ^ "Finding their Chinese 'roots'". Chinapost.com.tw. October 2, 2006. Retrieved January 7, 2017. ^ "Taiwan Communique no. 101". Taiwandc.org. Retrieved January 7, 2017. Wikimedia Commons has media related to Chen Shui-bian.